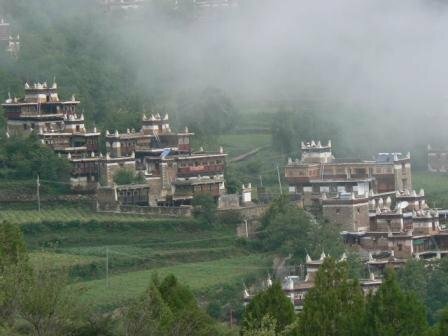 In the Sichuan province, the Chinese authorities forced Tibetan families to sell their land in order to use the plots for development projects and police barracks. The protestors were attacked and beaten by Chinese police leaving at least four protesters in critical condition. Police in western China’s Sichuan province attacked and beat members of a Tibetan farming family this week, leaving one in critical condition, after the group protested authorities’ efforts to force the sale of their land for construction of a police barracks, sources said. The Dec. 30 incident in Dzamthang (in Chinese, Rangtang) county in the Ngaba (Aba) Tibetan Autonomous Prefecture “left at least four protesters—Tare Kyi, Samlha, Ratna Dargye, and Lukyi—severely injured,” a local source told RFA’s Tibetan Service. “Samlha was left in critical condition,” RFA’s source added, speaking on condition of anonymity. The injured Tibetans, all members of one family, had joined with other families protesting government attempts to force the sale of their land for a police barracks and other development projects, the source said. “The owners are poor families, and the land is their main source of income,” he said, describing Dzamthang county deputy governor Tsering Namgyal as the official mainly responsible for attempts to take the land. No word was immediately available on the current condition of those injured in the clash, or on the present status of the properties sought by officials. Land grabs by Chinese authorities in Tibetan areas have led to frequent protests in recent years, sources say. In March, hundreds of Tibetans in a county in China’s Gansu province launched protests over the seizure of farmland for the construction of highways catering to state-linked gold mining and industrial interests. Unfurling huge banners criticizing what they called Chinese encroachment on Tibetan land, the protesters gathered to voice their opposition to the projects in Sangchu (Xiahe) county in the Kanlho (Gannan) Tibetan Autonomous Prefecture, sources said. And in April 2013, Chinese security forces detained 21 Tibetans following protests over the forced demolition of recently rebuilt homes in an earthquake-hit region of northwest China’s Qinghai province. At least six Tibetans and four policemen were injured in the clashes after over 100 area residents opposed the demolition of Tibetan homes in the town of Kyegudo in the Yulshul (Yushu) Tibetan Autonomous Prefecture, a local source said.